It’s been a funny coupla weeks on the blog – rants against the media at large, sponsored posts, shameless pleas for votes. Let’s get back to the important stuff in life – toasties and alpacas. 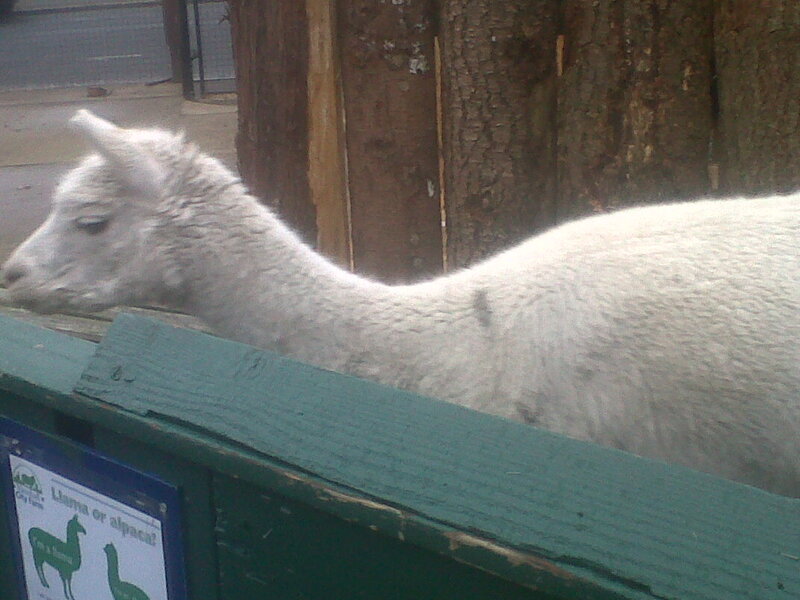 That’s an alpaca there. The toasties will come later. 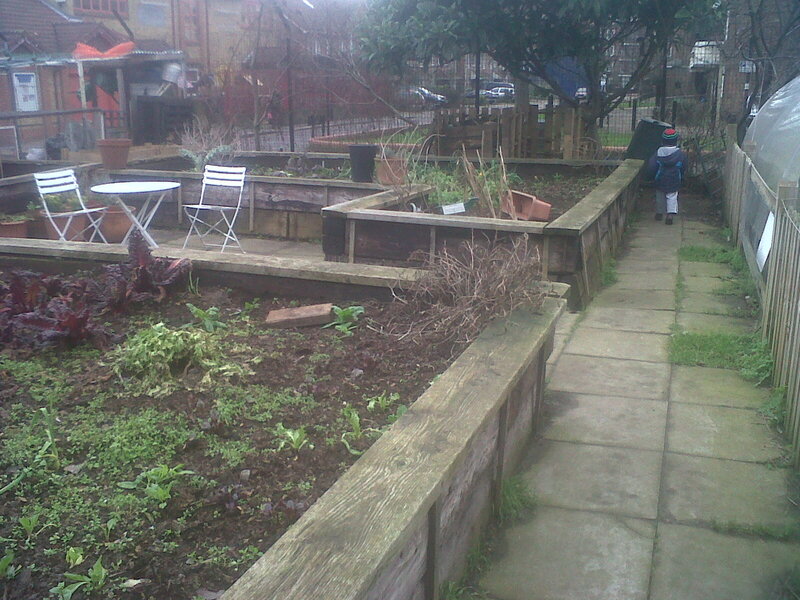 It’s probably time to revisit Vauxhall City Farm. Not in a physical sense – we’ve been there a loooot of times now. But in a blogging sense. I wrote about it in July 2011, and it was my 9th ever post. It was a paragraph long cause back then I was a bit scared to write too much in case I bored people. Oh how things have changed! Now I ramble as much as I like and everyone has so far been too polite to tell me how bored they are. So, on with the VCF action. We were at VCF today to meet a new friend, Maria. I’ve “known” her via the BLW forum for a long time, but since she moved to London, C’s mum and I have pressganged her into our SELBLWGang. Catchy, hey? She has one like Eva and one like Roo so that’s the minimum requirements met, and today she was visiting Vauxhall with the “one like Eva” aka Niamh. Before we went for lunch, we had a romp around the farm cause it’s always a fave of Roo’s. As I mentioned in that long-ago post, there are some animals there. But nowadays he knows their real names instead of just shouting “hor!” all the time. And when I say real names, I mean we’re now on first-name terms with the kune-kune pigs from New Zealand. Nathan will be celebrating Waitangi Day later on his blog so it seemed like a good day to make their acquantice. This one is Jenny and the more yellow-y one is Edward. Go and say hello sometime! They’ve always been Roo’s favourites, even though they would probably eat him given half the chance. They would definitely eat Eva if I leant too far forward over their stable door. Roo’s other favourite feature of VCF is the milkable cow, which he’s enjoying here with his friends Luke and Rufus back in August. If I remember rightly they all got very wet. 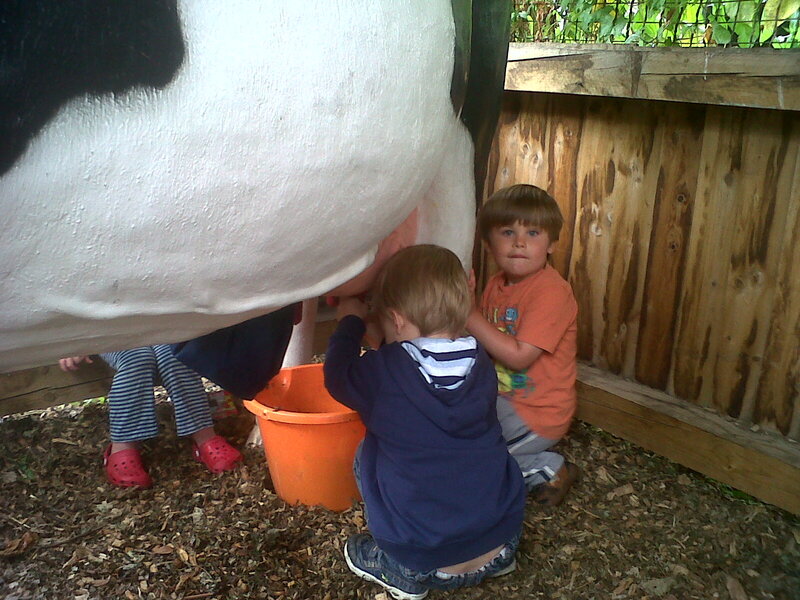 When we went there today, the milkable cow wasn’t working. 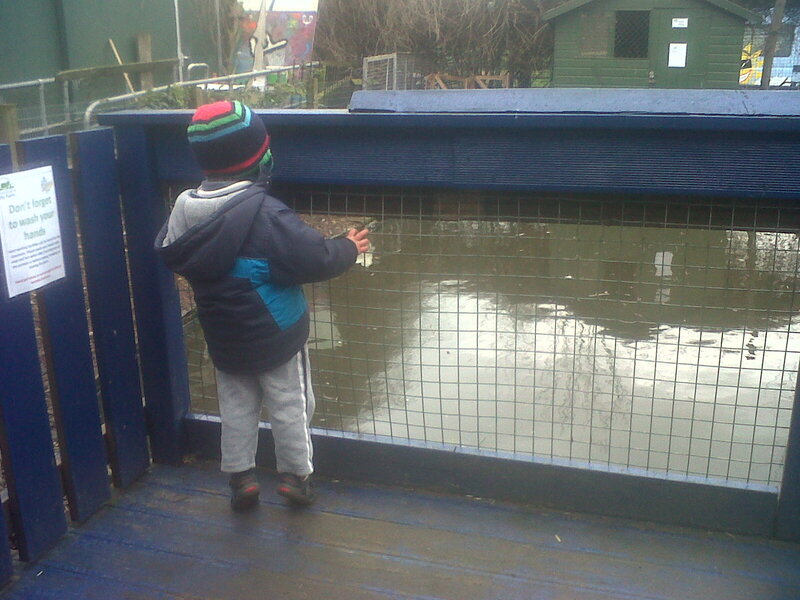 Given that we were going to lunch and then nursery and it was a bit if a chilly day, I’m quite glad it wasn’t working. Yes, it’s small but there’s enough to keep a small boy entertained. In the summer they run petting sessions, and they had seed planting in the peace pagoda. Roo planted a pumpkin and then watched it obsessively while it failed to do anything remotely like growing. We eventually ditched it when he wasn’t looking and bought a supermarket pumpkin instead. I may have mentioned before how bad I am at nurturing things. Sorry kids. Anyway, we were getting a bit cold and wet, so we popped a coin in the cow’s bottom (like you do) and decamped to the Ragged Canteen for lunch. Like many things in the Vauxhall area, the Ragged Canteen is a bit of an oddity. It’s part of Beaconsfield, an art gallery, and has suitably eclectic opening times. Currently they’re open 11-4 Wednesdays, Thursdays and Fridays, even though they don’t serve lunch till 12. It’s on an unpromising looking side street and you have to ring a buzzer to get in. So kudos to you if you actually get there and manage to eat lunch. We pretty much did. Getting there at 11:30ish, we were too early for the menu of the day (ever-changing vegetarian food), but they could do us a toastie. Even then, it took till almost 12 till the toasties arrived, which seems to be a feature of quirky cafes. So if you’re after lunch, aim for midday-ish. The main menu looked good, but with the nursery run to get to we couldn’t wait too long. But the toasties were pretty yummy, as was the complimentary bread and olives that came out while we waited. The bread was straight out of the oven and was beautiful. Obviously, my lacking-in-taste son snubbed it as his current favourite, “boy bread” is more of the economy white variety. He ate most of his cheese toastie, despite complaining that he didn’t like it. He’s just a complainer. Eva and Niamh both yummed up our sweet potato and feta toasties, with salad and chilli jam. What good little weaners! In fact, Eva could not got enough of the chilli jam and kept sticking her tiny fingers in again and again. There may be consequences later. Apologies for the lack of photos. I had chilli jam on my fingers. The only photo I got of the cafe area was the fuzzy one of some tablecloths, above. Don’t bother nominating me for “best photography blog”. It’s a nice space, even if the slate floors aren’t great for babies to crawl about on. Luckily Eva and Niamh were easily distracted by the nice bread. 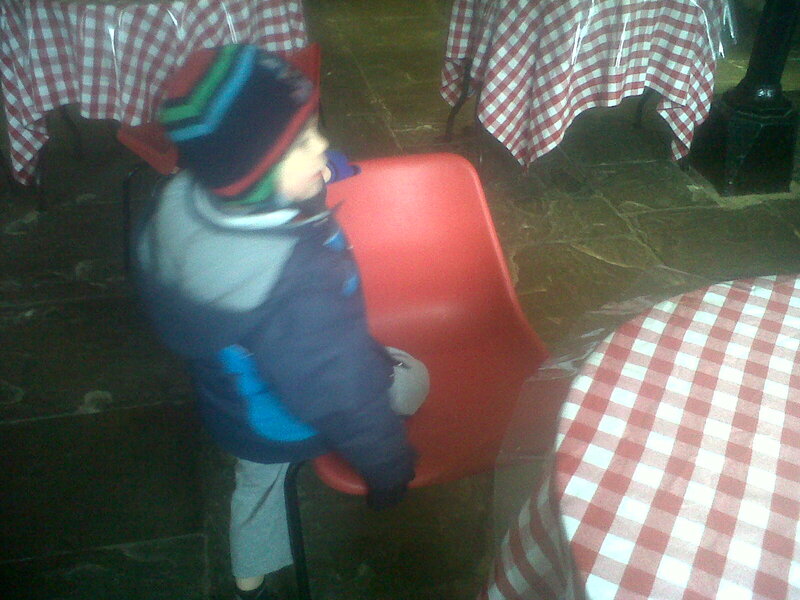 There was a highchair (yes, just one) and a trolley full of toys and books, so they were clearly baby-friendly. There was also a babychange, not that we needed it (chilli jam hadn’t worked its way through yet). They also charged me slightly less for Roo’s toastie, which was sweet. We were the first ones there, but the next batch of customers were also hauling buggies and bribes around. I’ve been there twice now and haven’t been to see any of the actual art bits. 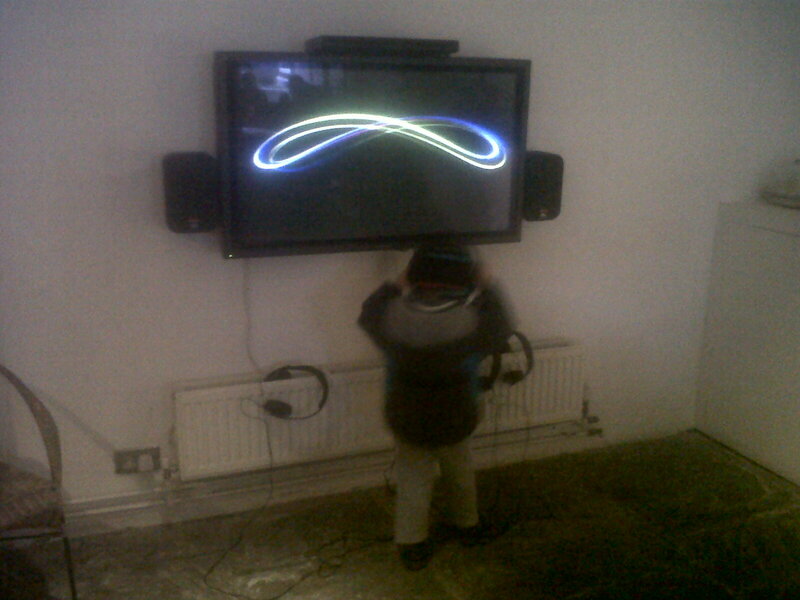 But they have a couple of video installations in the cafe and hey, Roo loves sound art. One day we might have a bit more time to look around. The first time we went, it was a spontaneous visit to source some Monmouth coffee for my friend Kay and it kinda turned into lunch. 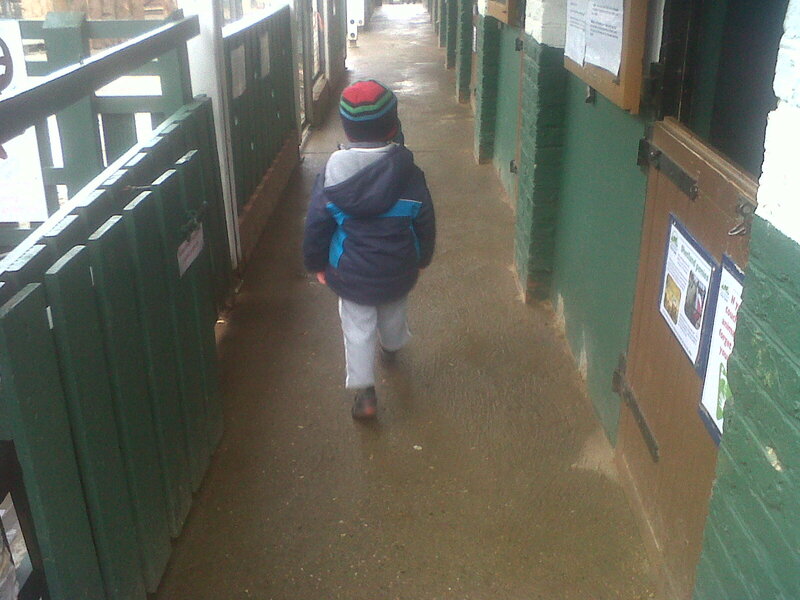 Today was overshadowed, as always, by the nursery run. But we’ll go back. VERDICT: An interesting cafe and lovely food. I hear the coffee’s good too. Service isn’t the quickest, but that’s to be expected when it’s all fresh. This entry was posted in Cake and the finest wines known to humanity (eating out), Food in cages! Walking around! Or maybe some alpacas! 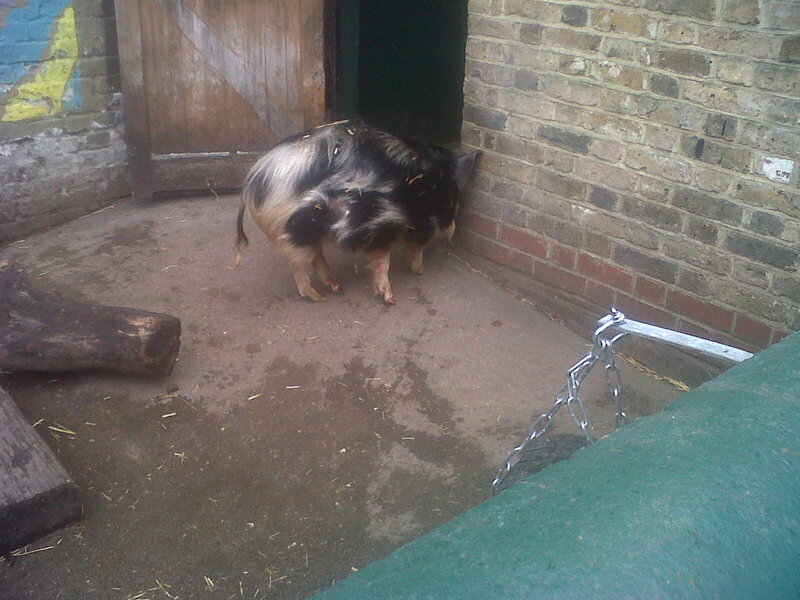 (Farms and zoos) and tagged animals, art, cafes, coffee, South London. Bookmark the permalink.